It may not be your first choice simply because its name is difficult to pronounce, but you will definitely not regret vacationing in Ochheuteal Beach. For now, it does not make it to the Top 10 list of top beaches in Asia, but those who’ve seen it will no doubt place Ochheuteal in their personal list of Top 3 beaches in the world. You’ll know why once you get there. To put the pronunciation issue to rest, Ochheuteal is said, roughly, this way: “oh’-chur-teal.” Khmer is one of the most difficult languages to learn primarily because of the difficulty of reading and pronouncing even the basic words. 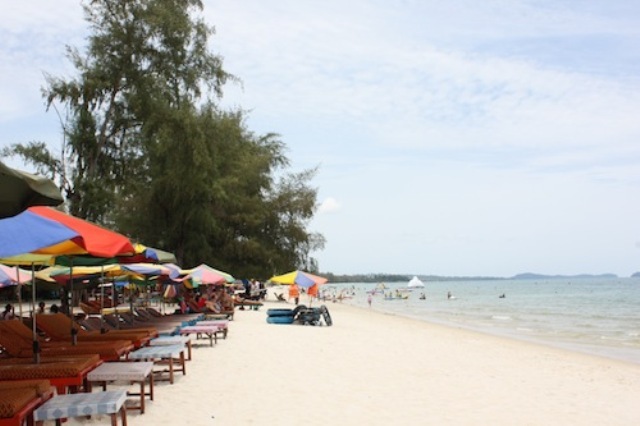 Simply put, Ochheuteal Beach is the center of all tourism activities in Sihanoukville. This provincial city situated on Cambodia’s southern coast is primarily known for its beaches, and its best beach is no other than Ochheuteal, which used to be called UNTAC Beach. Sihanoukville beaches are never as crowded or congested as the leading beaches in Asia; Ochheuteal is the most frequently visited beach in Cambodia and yet it is relatively uncongested compared with the likes of Phuket in Thailand, Bali in Indonesia, and Boracay in the Philippines. Every day, you will be among the many foreign and local tourists enjoying the pristine white sandy shores of Ochheuteal, while eating BBQ, drinking a glass of cool refreshing, freshly squeezed fruit juice, or indulging in a fun water sport, such as jet skiing, snorkeling or simply wading along the shallow shores. Strolling down this 2-kilometer long white-sand beach is quite an experience especially as the sun is setting in the horizon. Sandwiched between the equally inviting Serendipity Beach and Otres Beach, Ochheuteal offers a number of fun and leisure activities for all its visitors. In addition to swimming, snorkeling in clear blue waters, and sunbathing on luxurious deck chairs, guests will definitely enjoy the exotic Khmer dishes and sea foods offered at the many restaurants and smaller food stalls on the beach. For their customers’ ultimate dining and drinking pleasure, the restaurants offer their own sun beds for free to allow diners to enjoy the beautiful beach view. Now imagine reclining on these beds while sipping your favorite ice cold beer or a freshly prepared smoothie. Drinks and foods are cheap: a bottle of beer is only US$0.50. But that’s not all. As you lie relaxing, local women normally pass by to offer a very affordable yet extremely relaxing massage by the beach. There are also bars and pubs for all-night dancing, drinking and partying. Nightlife is so exciting here that most tourists say the beach is even better after the sun has set. Finally, you should visit Ochheuteal Beach and hang out there since it is very near the center of Sihanoukville, and most definitely just a walking distance from your hotel. Walking along the eastern part of the city will definitely lead to Ochheuteal. Make sure to treat yourself to the most relaxing tropical experience you could every get. If you want more beaches in your options, Sihanoukville’s other beaches are Independence Beach, Sokha Beach and Victory Beach.